YOU GUYS!! I'm just BLOWN AWAY by all the love for the Grilled Chicken Shawarma Recipe! Y'all literally had me in tears yesterday with all of the pictures of your recreations! I love it! 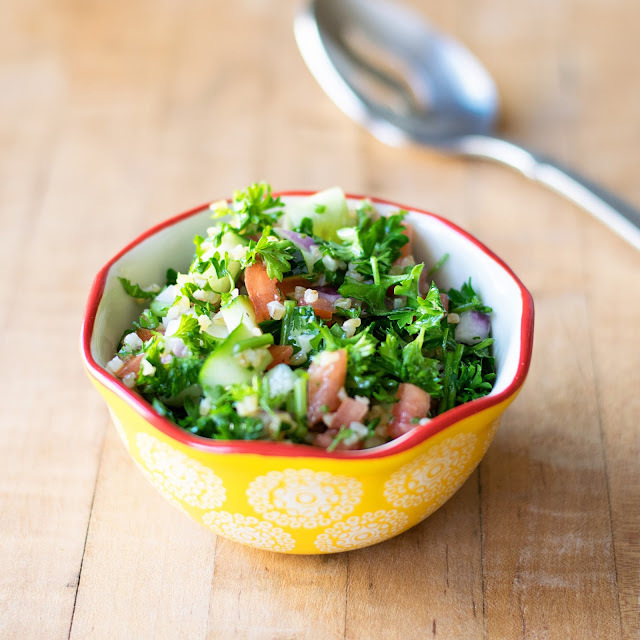 So in the spirit of this week's Middle Eastern food adventure, we're going to whip up a fresh and flavorful batch of Tabouli (Tabouleh) Salad! For this Tabouli Salad Recipe you're going to need a few simple ingredients. So to get things going, you'll need to cook the bulgur wheat. Just follow the directions on the packaging. Bulgur wheat was new to me, so in case you are wondering what it is, let me fill you in! Bulgur wheat is a whole wheat that has been cracked and partially boiled. It's a very tiny grain. I really like it and use it in place of rice a lot. While the bulgur wheat is cooking, you can prepare the rest of your ingredients. You will need to scoop out the seeds and ribs of your tomatoes. This will keep the Tabouli Salad from getting watery. After that you will need to dice it up into small pieces and place it into a mixing bowl. Next, dice your cucumber and add it to the bowl as well. Finally follow suit with the red onion. After that you will need to chop the parsley. I like using curly parsley for this recipe because it's a little bit hardier than the Italian flat leaf. It's at this point you can also chop the mint if you chose to add it. I'm not personally a fan of mint in my Tabouli Salad, but it is a traditional ingredient in the dish. Add the chopped parsley (and mint) to the mixing bowl. By now the bulgur wheat should be finished cooking so you can add it to the bowl as well. Time to make the dressing for the salad! In a small mixing bowl (or measuring cup) you will combine the oil, lemon juice, salt, and pepper. Whisk it up with a fork until it is all blended together. After that GENTLY toss everything together so that the dressing coats all the ingredients in the bowl. 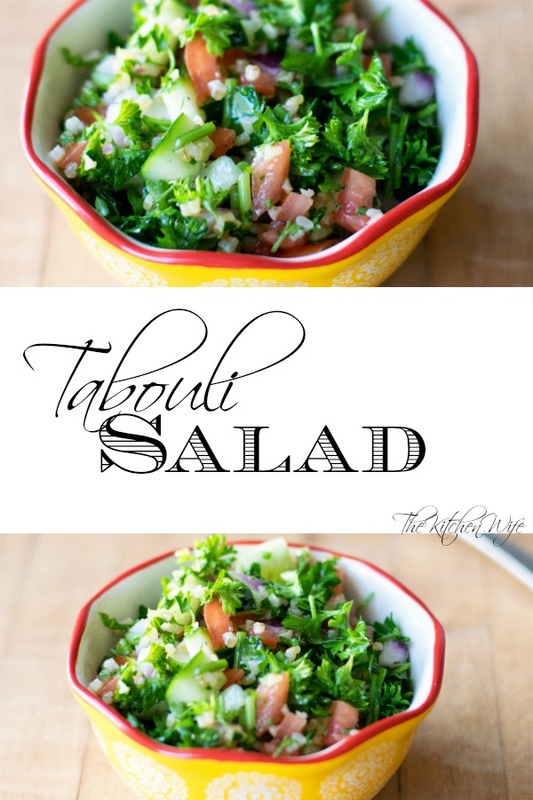 And now your Tabouli (Tabouleh) Salad is complete! You can serve this at room temperature, but I personally like to place it in the refrigerator for a couple hours to get nice and chill. I love all the bright colors of this dish! When you look at it you just see flavor and vibrance! The taste is so fresh it pairs PERFECTLY with the Grilled Chicken Shawarma and Saffron Rice Recipe. 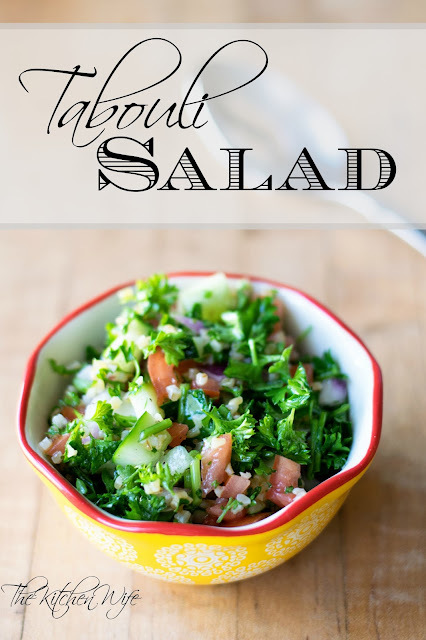 I know you are going to love this Tabouli Salad Recipe, so get in the kitchen and give it a try tonight! Prepare the bulgur wheat according to the directions of the packaging. Seed and dice the tomatoes, as well as preparing the cucumber, onion, parsley, and mint. Add everything into a mixing bowl. In a small bowl combine the oil, lemon juice, salt, and pepper. Whisk together until well blended. Pour the dressing over the salad and gently toss everything together until well coated. *You can serve at room temperature or place in the refrigerator for a couple hours to chill.